Night parrots were thought to be extinct for a time, however there have been a small number of sightings in recent years in south west Queensland, the far north of South Australia and the Pilbara region of Western Australia. Mike Griffiths has recently travelled to our region from Western Australia on a quest to film the endangered bird. “It is highly likely that there are still night parrots in the area,” Mr Griffiths said. Night parrots are nocturnal, ground-dwelling birds. They take to the air only when disturbed or in search of water. They are a fairly small parrot that is a yellowish-green colour and with mottled dark brown, black and yellow. Mr Griffiths’ aim was to get in touch with landholders who may know of night parrots. He plans to then work with those people to set up motion triggered cameras to film or photograph the rare birds. It’s Mr Griffiths’ passion and hobby to film unusual birds and small animals. “People on the land know far more about local wildlife than they are given credit for,” he said. “There is nothing more interesting than listening to their stories.” Mr Griffiths will again be in the area in September to check cameras and set up more observation sites. 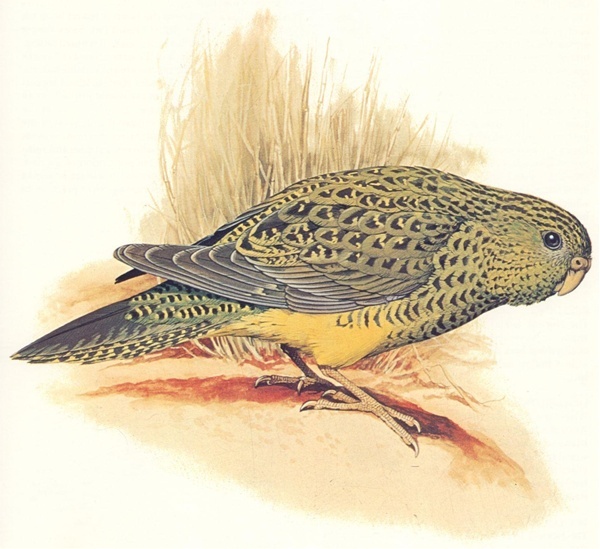 If you think you have seen a night parrot or any rare and unusual fauna, you can have them recorded by contacting Mike Griffiths on: 0428 530 989 or the local regional Landcare facilitator Anne Holst on 02 6872 2144. The location of these birds and animals can be kept confidential if preferred. Anne Holst 6872 2144 (Western), Tanya Slack-Smith 6828 0121 (Namoi) or Danielle Littlewood 6840 7805 (Central West).